I’m a Divi Theme User and I’m Proud of It! As the theme for today’s Ultimate Blog challenge suggestion, I want to tell you about a WordPress theme I use and I swear by when creating websites for my clients and for myself. Yes, I’m a Divi theme user and I’m proud of it! If you’re not familiar with the Divi theme, it was created a few years back by the Elegant Themes team and it has evolved and has greatly improved since then. Coupled with the Divi Builder plugin, you can create unlimited sites and blogs without a lot of design and coding experience…great for those non-techie individuals looking to create sites in hours and not days. 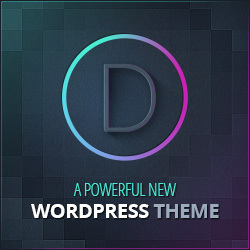 Visit the Divi theme info page and test-drive it yourself for free. I have a feeling you will like it and buy it for yourself! Granted there are other dynamic theme and layout builder platforms available, but I believe you will still choose Divi over the competition. If you decide you don’t have the time to build your own website or blog using the Divi theme and plugin pack, feel free to contact me and I’ll consult with you on the perfect layout and design for your next business website.